Identifier is exactly "2016-0242-F "
This collection contains photographs and videos relating to the Israeli and Palestinian Peace Process, which also includes material relating to Middle East Peace as a topic. President William Jefferson Clinton and First Lady Hillary Rodham Clinton are the primary participants in the materials, along with various Clinton administration staff as noted. The date ranges for the material includes October 25 through 29, 1994, September 28, 1995, November 5 through 6, 1995, October 15 through 23, 1998, March 25 through 26, 2000, and July 11 through 25, 2000. 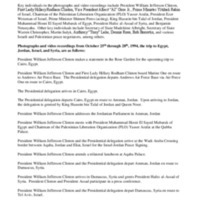 Photographs and video recordings relate to arrivals, departures, in-transit events, meetings, photo-ops, press briefings, and other Presidential ceremonies during the requested dates.